ZOODLES stands for ZUCCINI NOODLES! Huh? That’s right, zoodles are spaghetti-like strands made from spiralized, raw zucchini. Why are Zoodles good for you? are a good source of essential nutrients like vitamin C, vitamin A, vitamin B6, potassium and other minerals and antioxidants. With Zoodles you can treat yourself to a much bigger portion size for less calories and if you are following a gluten-free diet or just a low-carb diet, zoodles are a fantastic alternative! So, you don’t have to give up pasta, just use zucchini noodles as your noodle base for numerous healthy gluten-free recipes. Making fresh zucchini noodles at home is super easy and fast! Although Zoodles are super easy to make, they can be tricky, because they’re made up of over 95% water and therefore, can get mushy and lifeless real quick. Don’t worry, we have you covered! Watch the video below and discover a few great tips tips and three best ways to cook spiralized zucchini, so that you’ll never have a soggy zucchini noodle again. You can easily prepare fresh homemade Zoodles with a simple, inexpensive, handheld spiralizer or a more expensive and professional one. Want more food recipes for Zoodles and other Spiralized Veggies? Inspiralized shows you how to transform more than 20 vegetables and fruits into delicious meals that look and taste just like your favorite indulgent originals. Zucchini turns into pesto spaghetti; jicama becomes shoestring fries; sweet potatoes lay the foundation for fried rice; plantains transform into “tortillas” for huevos rancheros. Ali’s recipes for breakfast, snacks, appetizers, sandwiches, soups, salads, casseroles, rices, pastas, and even desserts are easy to follow, hard to mess up, healthful, and completely fresh and flavorful. Best of all, she tells you how to customize them for whatever vegetables you have on hand and whatever your personal goal may be–losing weight, following a healthier lifestyle, or simply making easy meals at home. Here, too, are tons of technical tips and tricks; nutritional information for each dish and every vegetable you can possibly spiralize; and advice for spiralizing whether you’re feeding just yourself, your family, or even a crowd. A delectable array of healthy and delicious recipes that work with any spiralizer! From the author of Inspiralized comes the ultimate guide on spiralizing, with clean meals that fit into any diet, from paleo to vegan to gluten-free to raw. Each recipe was crafted to become a well-loved staple in your repertoire with a focus not only on healthy eating, but also on easy cooking. Diet customization options, veggie swap suggestions, and special attention paid to one-pot, make-ahead, and no-cook meals ensure that Inspiralize Everything will become a workhorse in your kitchen. “Zoodles Spiralizer Cookbook makes it clear that you don’t have to choose between eating healthy and satisfying your cravings.” Caroline Kitchener, contributing writer to The Atlantic. Working more vegetables into your diet can be challenging. 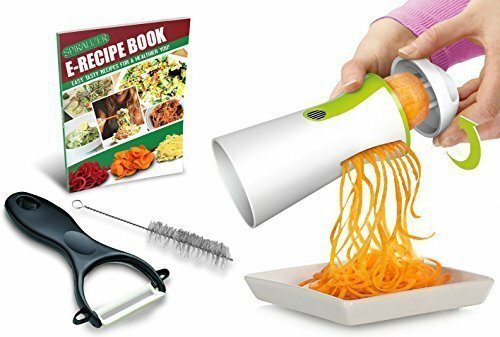 But with Zoodles Spiralizer Cookbook you can get the health benefits of vegetables with the gratification of your favorite pasta and noodle dishes. Enjoy Fettuccine Alfredo or Chicken and Veggie Chow Mein free of carbs, dairy, gluten, refined sugars, and grains with this all-in-one spiralizer cookbook. From the author of Paleo in 28, your must-have spiralizer cookbook for making ridiculously easy and delicious meals―perfect for any spiralizer. There is one kitchen tool Kenzie Swanhart (aka food blogger Cave Girl in the City) couldn’t be without: her spiralizer. It makes eating more vegetables a cinch, and it’s just plain fun to use. In Spiralize It!, she shares her passion and proves that you can indulge in your favorite foods by swapping carbs for a variety of veggies, from carrots and sweet potatoes to butternut squash and zucchini. With recipes for all palates and preferences―Paleo, vegetarian, vegan, gluten-free, this spiralizer cookbook takes a creative spin on any plate. Recipes in this spiralizer cookbook include: Asian Broccoli Slaw, Butternut Squash Enchiladas, Chicken Zoodle Soup, Raw Rainbow Noodle Salad, Shrimp and Cucumber Noodle Bowl, Sweet Potato “Rice” Balls, Simple Steak Fajitas, Teriyaki Chicken and Broccoli Noodles, Vegetable Lo Mein, Zucchini Ribbon Crisp, Simple Pear and Almond Tart, and much more! Spiralizing is a fun, delicious way to eat healthier―and The Big 10 Paleo Spiralizer Cookbook is the only spiralizer cookbook to combine the variety you want with the ease you need. From zoodle pastas to robust salads and hearty soups, the spiralizer has opened up a whole new world for those who follow a paleo, gluten-free, or low-carb lifestyle. Yet between recipes that require hard-to-find ingredients and spiralizer cookbooks that are too complicated, knowing what to do with which vegetable can be challenging. On a personal mission to make it easy and fun to eat more vegetables is paleo aficionada Megan Flynn Peterson. Following the release of her blockbuster debut, The Big 15 Paleo Cookbook, Megan turned her attention to one of the most versatile appliances in paleo cuisine―the spiralizer. With The Big 10 Paleo Spiralizer Cookbook Megan shows you that variety and simplicity go hand in hand. By sticking to the 10 best vegetables for spiralizing and including multiple recipe variations, The Big 10 Paleo Spiralizer Cookbook is the only spiralizer cookbook to include more than 300 total recipe options. For easy and delicious vegan cooking recipes! Use your spiralizer to cook delicious and creative meat-free and animal-free recipes for you and your family. Enjoy mouthwatering animal-free spiralizer dishes! What are your favorite ZOODLES Recipes? Share Below!